Late night hosts from Jimmy Kimmel to Seth Meyers all reacted to the biggest story on Thursday: The testimonies given by Christine Blasey Ford and US Supreme Court nominee Brett Kavanaugh. "Millions of Americans watched the much-anticipated testimonies of Supreme Court nominee Brett Kavanaugh and the woman who accused him of sexual assault, Dr. Christine Blasey Ford... People were crying in front of their televisions, you would have thought Milo Ventimiglia got killed by a Crock-Pot," Kimmel said on ABC's "Jimmy Kimmel Live!" -- referring a scene on NBC's "This Is Us." Kimmel said the testimony was "riveting to watch" and that Ford was "an exceptionally believable witness by all counts." "So at halftime, it seemed like the Democrats were up like 32-to-nothing," Kimmel joked. "But then Brett Kavanaugh sat down and delivered an impassioned, 45 minute speech delivered like a frat out of Hell." The host said that his testimony was loud, angry and tearful. "I haven't seen this much crying and yelling since the Cubs won the World Series," Kimmel said. 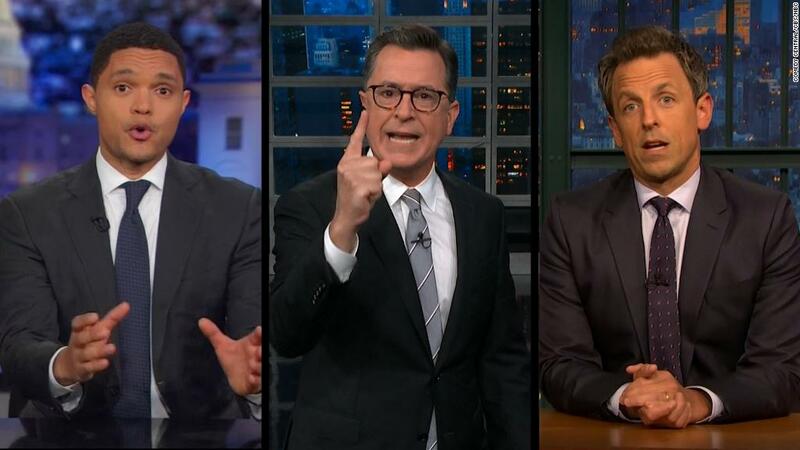 Kimmel's contemporaries in late night, such as Stephen Colbert of CBS' "The Late Show," also had a lot to say about the hearing. Colbert mentioned in his monologue the comments made by Sen. Dianne Feinstein that this hearing was not a trial for Ford, but a job interview for Kavanaugh. "Okay, Brett, it says here on your resume you're a Yale grad, very impressive, finished at the top of your class, and you have multiple sexual assault allegations against you," Colbert said, pretending he was having a job interview with Kavanaugh. "I'm sorry but you're just not Arby's material. Try the Supreme Court." Colbert then showed a clip of Kavanaugh saying in his testimony that "I fear for the future." "Hashtag me too," Colbert responded to cheers. Trevor Noah of Comedy Central's "The Daily Show" called the hearing the "big showdown everyone has been waiting for" before showing clips of people on airplanes watching it. "Yes, that's right, even people on planes were watching the hearings," Noah said. "And it was so gripping that it was first time that people were praying for a delay." He joked that even the flight attendants were watching the hearings, mimicking them telling passengers to "get your own peanuts!" NBC's Seth Meyers spent more than ten minutes giving the hearing a closer look on "Late Night." He said that Ford's testimony caught Republicans off guard. "In fact, even Fox News, the network that spends all day parroting Republican talking points, said Dr. Ford's testimony was bad for the GOP," Meyers said. "Wow, you know it's bad when Fox News calls it a disaster."